You won’t find the PadFone X on many Most Anticipated lists. For that matter, it’s probably not on many people’s radars at all, despite offering some fairly unique functionality. It might have been had it come out in a timely manner. As it stands, this device was announced at the beginning of 2014 and has still yet to make its way to U.S. carriers. That sure seems likely to change, however, according to a fresh press render shared by Evleaks. The image shows the device is indeed headed to AT&T, as we learned before, and is fairly unassuming in execution. It essentially looks like an iPhone 3G with different branding, and much less shiny. It’s worth noting that what we’ve seen of the PadFone X before looks slightly tweaked here, such as the lack of a speaker grill under the rear-facing camera. Maybe Asus made some last-minute tweaks. Otherwise, as has already been unveiled, the device is set to feature a 5-inch 1080p display, 13-megapixel camera, 2.3GHz quad-core Snapdragon 800 processor, 16GB of storage (microSD expandable), 2GB of RAM and a 2300mAh battery. It can also connect with a separate 9-inch PadFone station, which sports a 9-inch screen and 4990mAh battery. 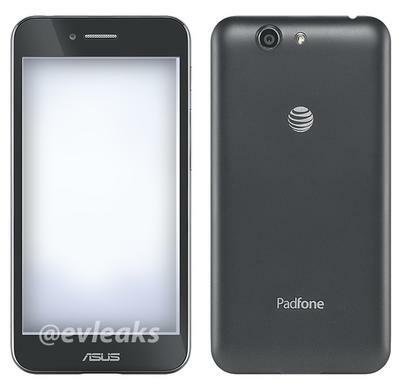 As recent as the beginning of May, AT&T teased the PadFone X, seemingly suggesting that the handset’s capabilities would help you get a date. With so many higher profile devices available—and one getting announced next week—there doesn’t appear to be any room left for the PadFone X (if it even comes out). Perhaps an announcement will be made soon—along with an explanation as to why the device is taking so long to come out.